Along with all the tomatoes, zucchini and cucumbers I finally harvested the carrots this past weekend. I just love the color burst of orange, yellow and purple carrots. Ah, the joys of growing your own veggies! We eat our share of baby carrots year round. They are perfect for lunches or a snack with hummus. They last a while in the fridge and pack extremely well. This dish, however, is a break from the usual carrots. I never used to like cooked carrots much growing up. As I get older I try more and more foods and ways of preparing them. Maybe I’m getting wiser with age! Call it what you wish, I definitely like a good roasted carrot. The flavor combination of honey and mustard is perfect. Not only are my husband and I big mustard fans (the kids too for that matter), the kids also like just about anything with honey. If you have a picky eater, definitely give this a try. 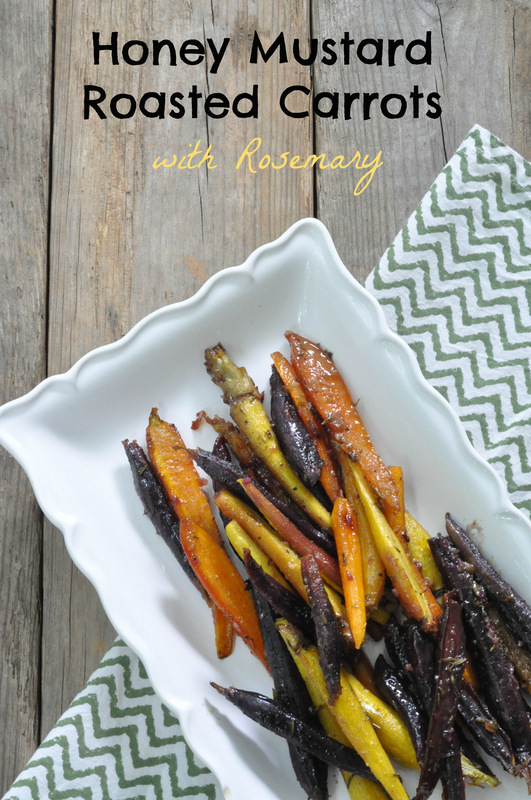 The roasting brings out the sweetness in the carrots and the honey makes them extra sweet and a little crispy. The longer you bake them the more tender they get, so if you like them still crispy cook them a little less. 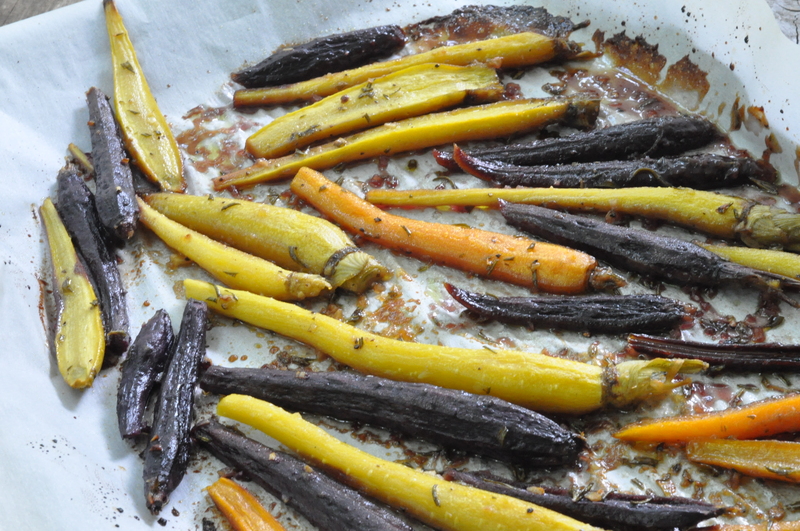 Preheat oven to 425 degrees and line a sheet pan with parchment paper. Whisk together the honey, olive oil, mustard, garlic, rosemary, salt and pepper. Toss with the carrots to coat. Pour the carrots with sauce onto the sheet pan and bake for about 30 minutes, cooking time will depend on the size of carrots and desired tenderness. These heirloom carrots are beautiful. I am sure you could do similar with any of your garden veggies. 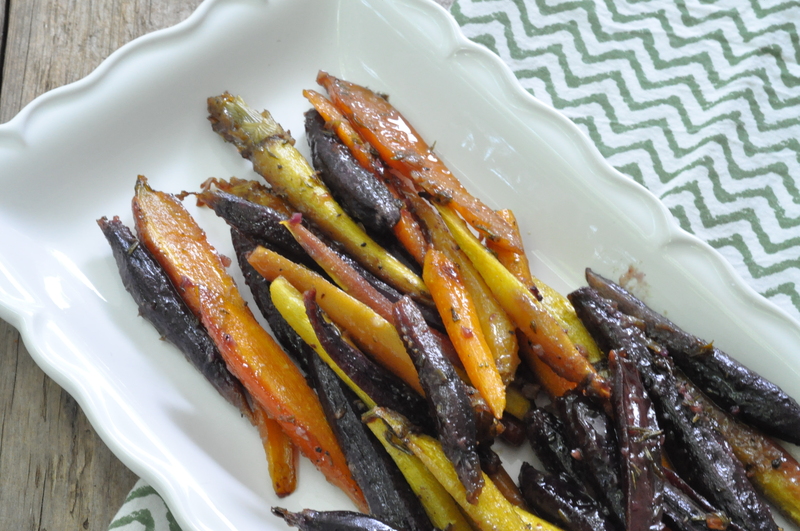 🙂 I bet these taste like garden candy; I love roasted parsnips, carrots or any root vegetable with mustard/honey/rosemary. I swear, we are tummy kindred spirits. Just beautiful, and it’s a great idea to use parchment to prevent the sugars and oil from burning. I know what I am making tonight to accompany my salmon. Nice! Thanks Shanna! The parchment definitely helps cleanup, even better than my Silpat. Over the weekend I also tossed in a zucchini and a squash with the carrots and they were tasty too. I think the spaghetti squash may be next to come out the garden…. I just picked 5 spaghetti squash this morning! Now to decide what to do with them. I have frozen a couple jars of pesto already, hope to make more to eat and freeze, I love that stuff! Goat cheese, can’t get enough of that either. I love that you grow all the foods I buy at the farmers’ markets 🙂 Love colored carrots. What a fragrant way to prepare. I could seriously start my own produce stand! Especially with the tomatoes and zucchini. Yesterday I also picked five spaghetti squash. Crazy here. Sounds fabulous. I’ve got carrots in my vegetable box that are almost ready so I’ll have a go at this recipe very soon. Emma. I hope you enjoy! I still have a drawer full of carrots from the garden. Honey and mustard? What a great combination. When I was young, I used to love crunching carrots. I also didn’t like eating cooked ones. My mother always overcooked them. She mostly added them to stew or steamed them. I love carrots and now I eat more carrots when I’m serving French fries. Less fries more carrots. Thanks for sharing this. I shall try this with my grainy mustard. I tend to prefer the grainy one. Have a great weekend!